Israeli Prime Minister Ehud Olmert has survived three no-confidence motions in parliament, in the latest backlash over his handling of the 2006 Lebanon war. The Knesset voted against the motions with wide margins - with votes against totalling 60-62 compared to 26-28 for. A majority of 61 of the 120 members in the Knesset is needed to force the government to resign. Last week tens of thousands of Israelis rallied in Tel Aviv calling for Mr Olmert to resign. Pressure has been building on the prime minister after an inquiry accused him of "serious failure in exercising judgement, responsibility and prudence" during last year's 34-day war with Lebanon. Opposition leader Benjamin Netanyahu, who lodged one of motions, opened the parliamentary debate. "A storm is brewing in all corners of the country. The people are telling you a simple thing - you have failed. Accept the responsibility and go home," he said. 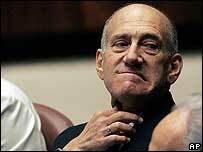 Ran Cohen of the left-wing Meretz party added that Mr Olmert's government taken the country into a "crazy adventure". "Because of you, the country is doubting its future," he said. But Mr Olmert has said he will stay in office and implement the report's proposals. The report, issued after a six-month investigation led by retired judge Eliahu Winograd, and commissioned by Mr Olmert, did not explicitly call for resignations.